In answer to your question, Ger … I feel it’s hugely disrespectful and ignorant. They obviously don’t realise that they are destroying a symbol of their own tradition as it’s reflected in our beautiful ‘flag of union’ of the two traditions. 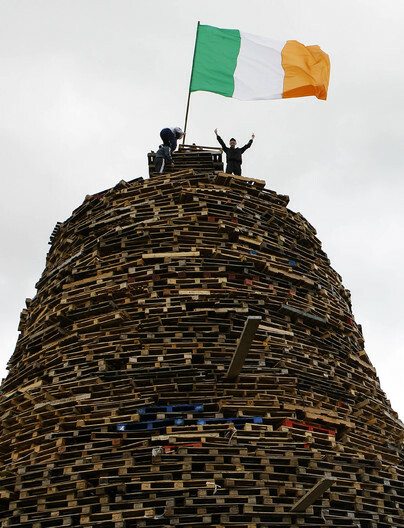 Those doing this to any flag are inciting hatred and need educating, as I do when Unionists come here. I tell them that King Billy should be the Nationalist hero because … he was supported by the Pope, he defeated the English King here in Ireland, he had so many Irishman in his army and his crack troops, the Blue Guard were all Catholic, carrying a Papal banner … yet they have hijacked him and are celebrating the Boyne on the wrong date anyway …. while their likes, the 85% Presbyterian and Church of Ireland men in the United Ireland movement, were the founders of Irish Nationalism and Republicanism, yet they allowed the IRA to hijack that whole tradition. They have it all mixed up but they are receptive and are no longer marginalised when they come here and see proper respect being shown for our flag and theirs. There is hope but we must all try our best, especially in such Hospitality businesses as ours. Previous Previous post: Were Computers more fun.